That's the quick and dirty way I'd describe Tooth and Tail, the second title put out (both dev'd and published, interestingly enough) by Pocketwatch Games, who had a pretty big hit with their arcade thief-em-up Monaco: What's Yours is Mine, back in 2013. With their sophomore effort now, finally, released, it looks like Pocketwatch is developing a bit of an interesting niche in indie gaming, as both Monaco and Tooth and Tail approach established genres (action/stealth and RTS, respectively) and turn them into faster, simpler games meant to pack the enjoyment of their more traditional genre brethren into smaller, more focused, arcade-style doses. And, while Pocketwatch probably isn't going to put the devs who make the stereotypical stealth and RTS games out of business with their approach, they most certainly have something cool going on here. Monaco brought a pleasing couch and controller-ready style to an old genre that is a new, faster, and damn fun iteration of its inspiration, and after a few hours slaying mine anthropomorphized animal enemies in Tooth and Tail, I can tell you that they've done just the same thing for the RTS. Before we get into how Tooth and Tail has transformed and/or eschewed the various facets of the RTS interface – the rules of which, as all fans will know, have been pretty damn solidly set in stone since even the earliest games in the genre, like Dune II – and whether the new approach works, let's take a look at the game's story and setting, both of which are notably unique themselves. Whatcha got here in terms of place and people (well, animal people) is a fictional country that is designed to be very much like a version of early-1900s USSR, but with small animals instead of people (think Soviet Redwall). In this world, the mice/rats that run the show, and their various squirrels, badgers, hogs, snakes et al. that work for them, have decided that they won't eat anything other than meat unless they absolutely must, which has led to them first subjecting pigs to being a food source, despite being equally, if not more, intelligent than the other animals, and then eventually creating a lottery system that drafts the other species (including mice/rats) into being food as well. This lottery is designed and run by the aristocratic Civilized, one of four major factions in the world, a group that also includes the business-like Longcoats, the poor Commonfolk and the fascist secret police known as the KSR. Not at all surprisingly to anyone who knows a little history about what happens when one rich group controls the fate of a bunch of other people, things get corrupt fast, and that corruption leads to revolution from the oppressed, namely the Longcoats and Commonfolk. And thus, we have the background for all the animal murderin' you'll do in T&T, and I have to say, what a finely realized background it is, in every respect. The writing here is top-notch, engaging you with the characters and feeling familiar both historically and in its choice to have talking animals, but also entirely avoiding feeling like a retread of anything, either real or fictional. A lot of that has to do with how fleshed out the characters and factions are, each with distinct personalities, motivations and aesthetics that are presented through excellent dialog, storylines and a truly impressive amount of detail thrown into each mission and between-mission setting, where you can talk to denizens of the world and find more missions to take on. This attention to detail isn't limited to the story, either. 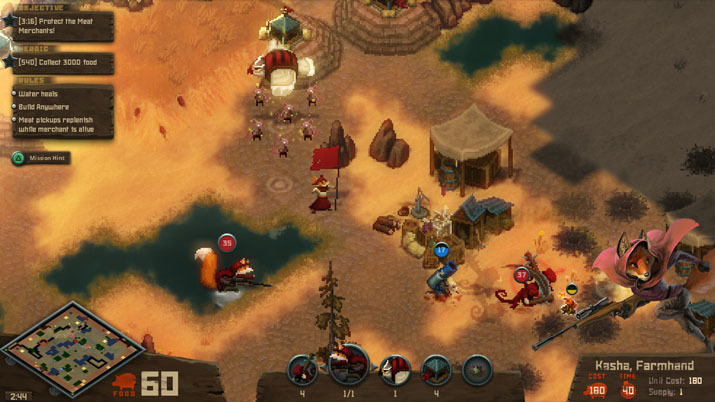 Tooth and Tail is an aesthetically gorgeous game, from the Russian-esque music that accompanies everything, to the excellent voice acting to, most especially awesome, the beautifully rendered art, done in a highly-detailed pixel style for interactive scenes and in a Disney-gone-dark, hand-drawn look for the rest of the game. For a game that's so heavily focused on mechanics and gameplay, it says a lot about Pocketwatch that they put so much work into the less “gamey” aspects of Tooth and Tail, and that they added a full campaign (and one which doesn't feel tacked on, at all) to a title whose main marketing point is its fast multiplayer skirmishes and simple controls. 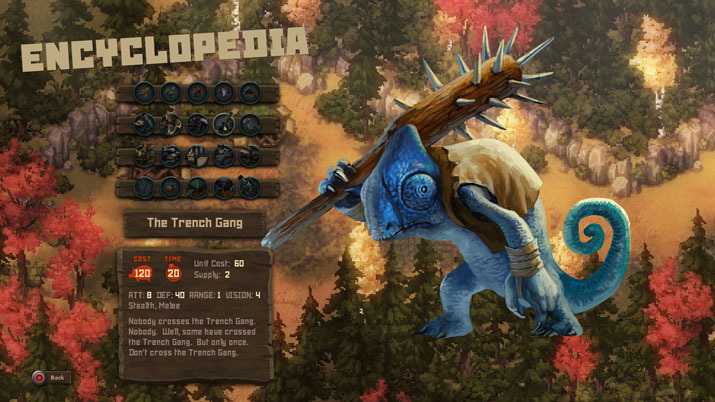 This respect given by the devs to every aspect of the title and game design in general is what takes Tooth and Tail from an interesting experiment for a niche crowd and elevates it to an all-around great game, and in fact, Pocketwatch owner Andy Schatz recently said on Quora that they added the campaign specifically to avoid the downfalls of multiplayer-focused games that lose steam because of a lack of players. By adding such a rich campaign and making every moment of the game something beautiful and cool on top of being fun, Pocketwatch has shown that they aren't just any old indie dev, and that's exciting, not just for Tooth and Tail, but when it comes to what these guys could do in the future. But leaving that big-picture future gazing aside, let's get to the (ahem) meat of Tooth and Tail. Because the big question every player is going to have about this title is, of course, does the combat work? It does, and it does well, though it takes some getting used to and it isn't so much a replacement for the traditional RTS as it is an exciting and inspired variant. So what's different about Tooth and Tail from, say, a Starcraft or a Company of Heroes, you ask? Well, for one, you aren't going to be using a mouse to point at anything. 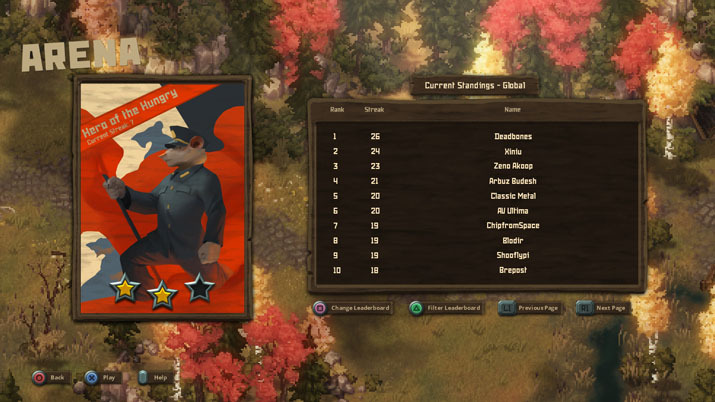 You can play Tooth and Tail with either mouse-and-keyboard or a gamepad, a design which works through the conceit of putting your armies and building construction under the control of your main character or general. Instead of clicking to select building locations and to tell units where to go, you'll, instead literally run to where you want things to happen with your leader. You can then build in that location (if allowed to) or set a rally point for units to move to. You can either move all units of a type or your entire army at once, and you can only have one rally point for each unit type or one for every unit that supersedes all other such points. The only buttons you need to use in Tooth and Tail are: for the two types of rallying, the 'interact' button (which both builds and interacts with a few features on the map), buttons to cycle through the available building and unit types (which are conflated if a building is what creates a unit, in a minor stroke of genius), and a button to 'burrow' (teleport) home. Herein lies the main innovation of Tooth and Tail, and what allows it to transform the typical slow-paced RTS into something fast and arcade-like. Not only does this simple control setup allow for the game to be played equally well with either keyboard-and-mouse or a controller (meaning it's console-ready as well as great on PC), the focus on one specific character and removing direct control of the other units causes you to have to be right there, in the thick of the action, all the time, which further feeds the quick arcade-style matches. On that point, it's a rare match of Tooth and Tail, either in the campaign or in multiplayer, that is longer than 10 minutes, and most are far shorter. This is by design, as Tooth and Tail is meant to be more of an RTS version of a party game like Towerfall or CRAWL than it is a strategy slog. Further aiding the game in this regard are the facts that units, even the badass expensive ones, are super fragile and likely to die fast, and that maps are small, even when playing in four-player rounds. You also only have one resource in the game (food), and that can only be acquired through a limited number of farm slots placed around Gristmills, which are also highly limited on the map and often located in dangerously exposed and highly-sought after spaces. If that wasn't enough, these farms each run out of food very, very fast for an RTS, so you will almost always be forced to move/expand territory quickly in every match or lose. I mean, whew, right? This is a game that is in every way designed to force you into fast and furious battle, absolutely demanding — through its set of specifically balanced mechanics — constant combat, quickfire strategies, and a resolution in under fifteen minutes. What other RTS can claim those things, and still look great, be approachable to newbies (this isn't your min-maxing of Starcraft) and be rewarding to play? Not any I know of, and while I still love my CoH and other long-sloggers, this kind of innovation and newness in a genre that hasn't had much of that in a while is not just refreshing, it's remarkable. Really, the only things I can say that are negative about Tooth and Tail at all, and this is after a lot of soul-searching to make sure I was giving this game a truly balanced critical look, is that it is so different from other RTS’s that it can be hard to adjust if you aren't ready for its ferocious speed and need for equally speedy strategies; and also that some RTS fans, especially those who look to play the long game and build out every possible unit and structure each match, might find Tooth and Tail to be frustrating when that strategy causes them to lose most of the time. What we're talking about at this point isn't whether Tooth and Tail is good, but instead whether it's your cup of tea. Because yeah, this isn't your typical RTS. But it is an RTS, it is beautiful aesthetically and incredibly well-made mechanically and, most mind-blowingly, it is absolutely something fresh and new in perhaps the most stagnant genre in PC gaming. For that alone, it deserves recognition, but that Tooth and Tail goes beyond its unquestionable innovations and also gives as much attention to story and looks as any other indie game out there today is something seriously special. For me, this is one of the good ones of the year, and I think everyone, from serious RTS fans to party-game couch-sitters, need to find a friend or two and give it a shot.